These are children aged under 15 years. They can be found hawking goods during school hours, assisting their parents in the shops, leading adult beggers or simply roaming the streets. Some of the children being sponsored. We also have some of these children based in orphanages that are struggling to keep them in schools. WIH will work with local schools to secure enrolment for the children. We will also request special monitoring for such children. 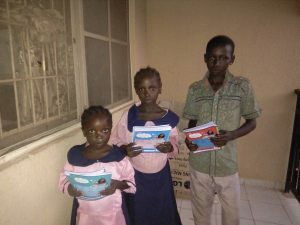 Since many of these children are from poor homes, WIH Child Rescue project will endeavour to cater for other sociological needs of the sponsored child buy providing moderate support for clothing and feed. WIH will maintain a database of referred children along with details of their estimated needs. We hope you will find a child to sponsor either fully or partially. Quaterly or yearly reports of each child will be sent to their sponsors and the sponsors have the opportunity of meeting with the child(ren) on demand. We employ you to join with us in taking our children off the streets and back into school. The future belongs to them. Let’s give them a good head start.